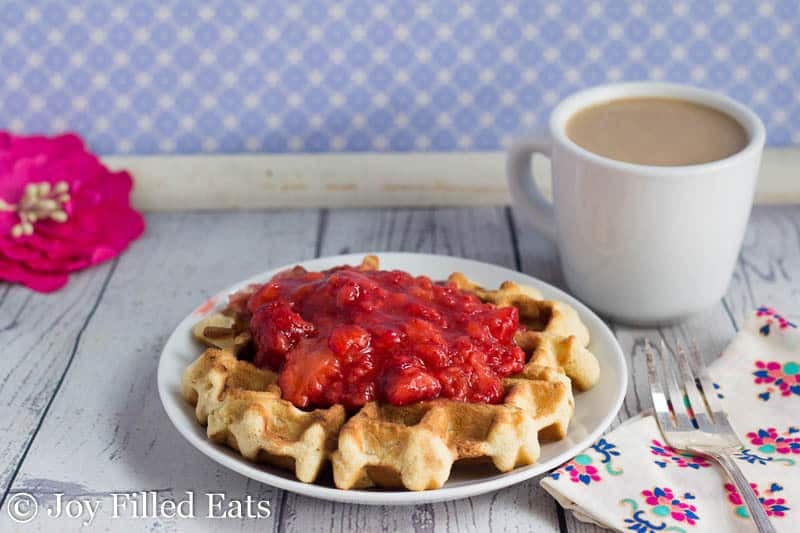 These Coconut Waffles with Strawberries is so easy it is the perfect weekday breakfast. It takes about 10 minutes start to finish. Most mornings I eat eggs for breakfast. About 9 out of 10 mornings. But sometimes I want something a little different. Since it is a Tuesday morning, and I have 2 of my 4 children underfoot, it had to be simple. Enter the coconut waffle. All you need are measuring spoons (tablespoon and teaspoon) and two small bowls. 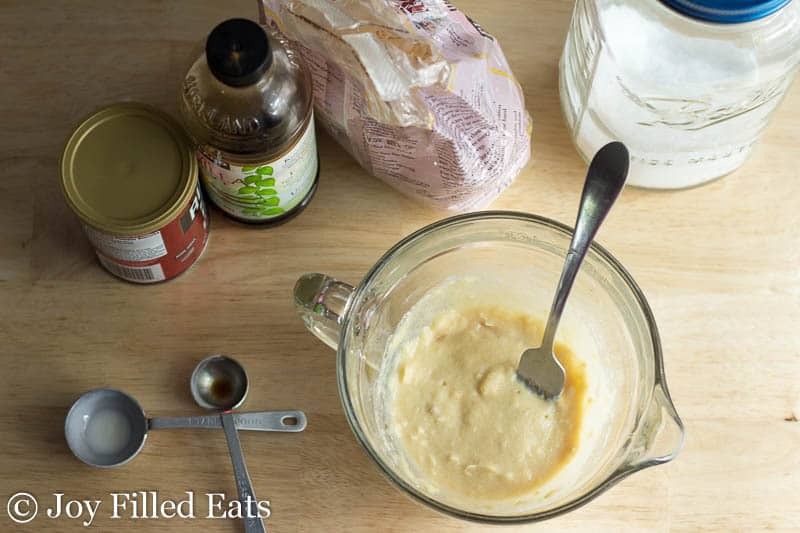 I made this batter twice and tried it as waffles and pancakes. The waffle came first but it just needed something. So I tried the pancakes with the strawberry sauce. Perfection. The waffle itself and the pancakes were equally delicious but the pancakes broke when flipping. If you don’t have a waffle iron feel free to make it into messy looking (but super yummy) pancakes. This recipe also works as a mug cake. Just microwave for 2 1/2 minutes. I had it that way for breakfast a couple days ago. 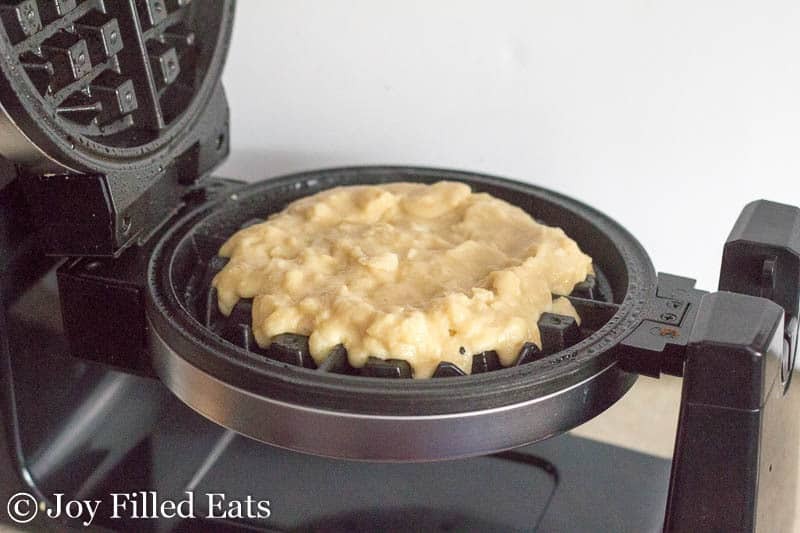 This makes one large coconut waffle, one mug cake, or three small pancakes. Perfect for one serving for breakfast. 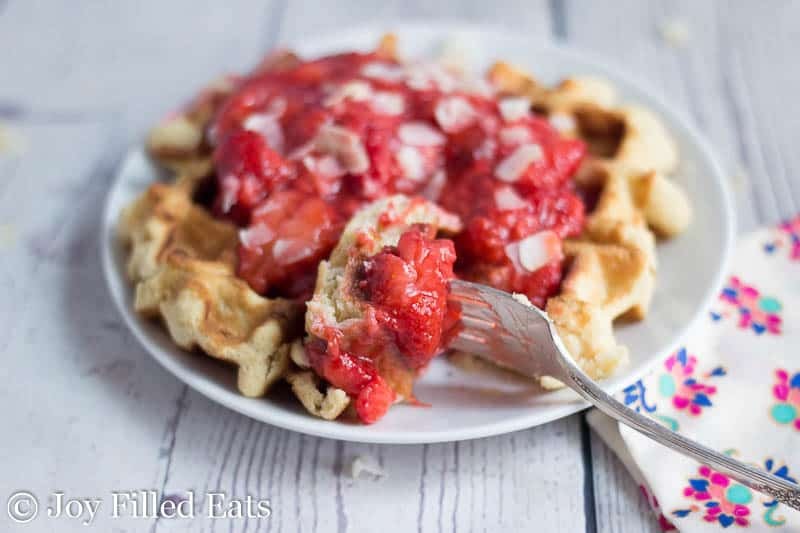 You can also just serve this with some chopped fresh strawberries and a drizzle of sugar-free maple syrup. 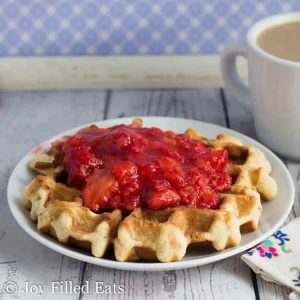 Combine all the waffle ingredients and mix until smooth. 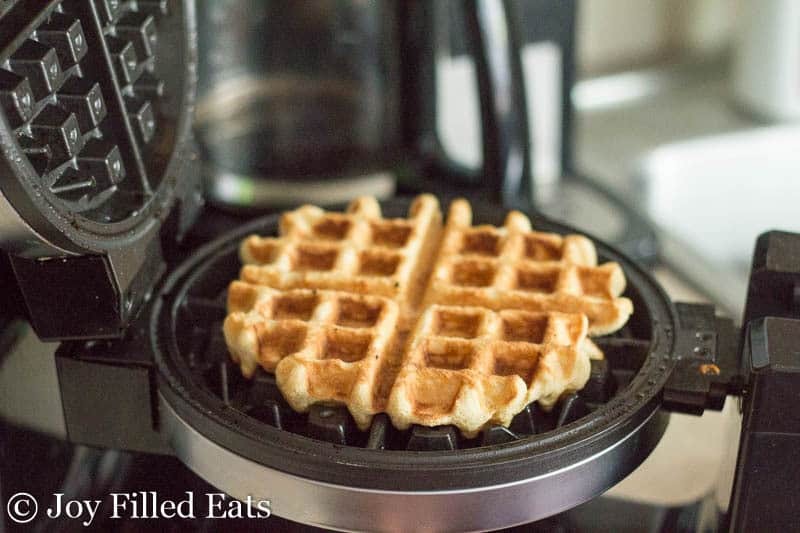 Grease waffle iron with cooking spray or coconut oil. Pour on batter (it will be thick). Cook until golden. Put on a plate. Make the sauce. Microwave the strawberries in a small bowl for about 90 seconds until thawed and warmed. Using kitchen shears cut up right in the bowl. 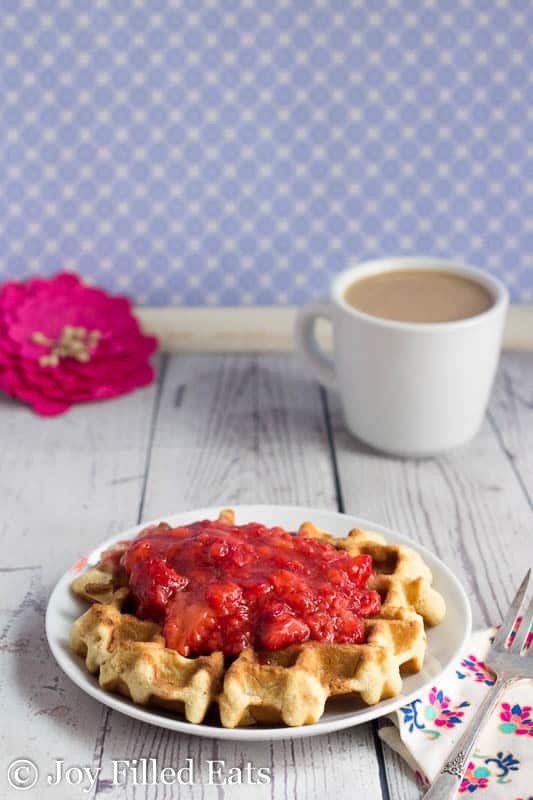 Dump the strawberry sauce on your waffle. Enjoy! This is set to make one waffle but you can easily change the serving size by clicking the #1 next to Servings. Adjust it to the number of waffles you would like to make. I made this today for breakfast, and while it was delicious it was also all crumbles. Where did I go wrong? I'm not sure. 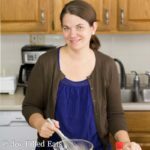 Did you switch out any of the ingredients? No. The only thing I can think of is that I didn't cook it immediately. I prepared it, but I cooked my kids' waffles first. Then I cooked mine. Is it possible the coconut flour soaked up all my liquid? Ahhh, that could be it. Coconut flour thickens more as it rests. If that happens again I would add an extra egg. OMG best waffle ever Thank You!!! It is great as a waffle! But even simpler breakfast in a bowl microwaved for 2 1/2 minutes. Thank you! What type of coconut milk? full fat in the can? Yes, that's what I used, other varieties would probably work too.